When you visit beautiful Lancaster County, Pennsylvania, you will most likely see an Amish buggy or two as you drive through town. The Amish Village is a great introduction to the Amish way of life. The Pennsylvania Amish have lived in Lancaster County for nearly 300 years. Their way of life focuses on service to God, family and community, and they want to perserve their values by keeping themselves separate from the influences of the world. 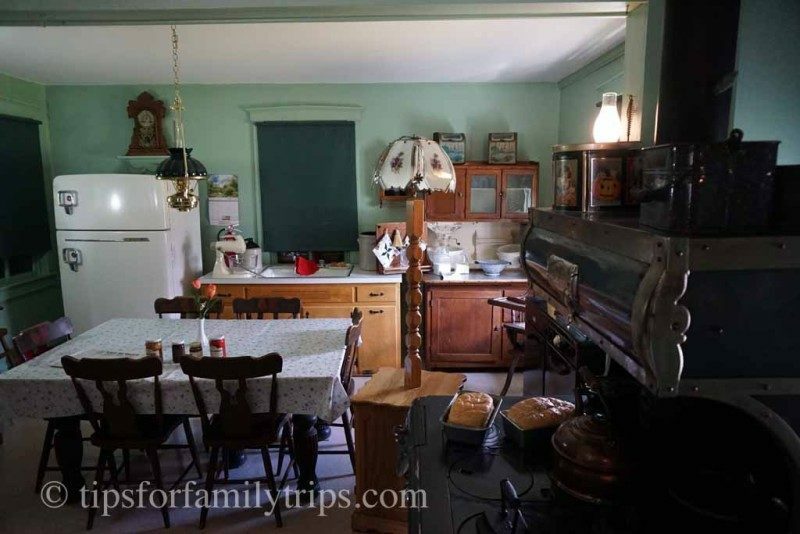 When we visited The Amish Village with our kids, the farmhouse tour was the perfect tour to learn about the Amish and keep my young kids interested in the tour. After the farmhouse tour, we spent an hour exploring the 12-acre village on our own. For those looking for a more comprehensive tour, The Amish Village also offers a 90-minute Backroads Bus tour that drives by working Amish farms and stops at an Amish quilt shop or bakery. The one thing you need to understand before you visit The Amish Village is that while this tourist attraction is authentic, it is not run by the Amish. The day we were there, there were no Amish at all in The Amish Village. Sometimes, an Amish schoolteacher is available to talk with visitors but she was not there the day we visited. One-room schoolhouse at The Amish Village. Here is what you can expect on the Farmhouse and Village tour at The Amish Village. The 25-minute farmhouse tour was exactly what I was hoping for when I brought my kids to The Amish Village. As we moved through the farmhouse, our tour guide gave a brief religious history of the Amish faith’s split from the Anabaptists and how William Penn welcomed them to Lancaster County nearly 300 years ago. The Amish population is growing each year since the average family has 7-10 children and most of them remain in the faith. We explored a replica of an Amish kitchen and learned how they convert appliances to gas to avoid using electricity. The Amish are not necessarily averse to progress, but they shun electricity because the wires coming into their homes represent the outside world coming in. They convert appliances and lamps to gas in their homes and they have running water. Replica of an Amish kitchen. We learned about the simple clothing choices the Amish make and how they use their clothing to symbolize their marital status. The Amish live peacefully in Lancaster County. They embrace the simple life and are hard working, responsible citizens who take pride in their work. 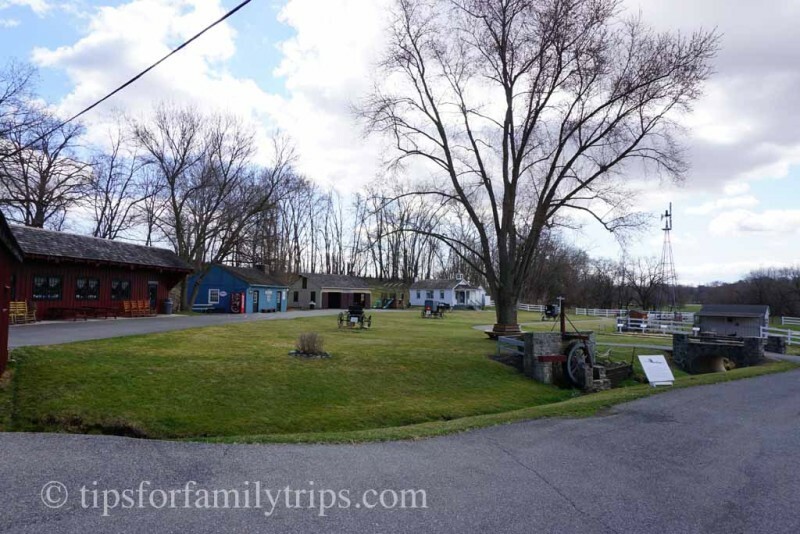 I loved the information from the guided farmhouse tour, but my kids loved the Amish village. After we left the home, we were free to feed the animals on the farm and wander around the village. Bring quarters to purchase food for the goats. This was the highlight of my 8-year-old son’s day. The horse was probably too used to being fed and tried to nip at anyone who walked by, but the goats were delightful. The village has replicas of stores and buildings you might see in the Amish country. We walked through a blacksmith shop and a one-room schoolhouse, where we learned that the Amish finish school in 8th grade. The little ones climbed in all the different kinds of Amish buggies that were in the yard for people to photograph and play in. After a few days of city sightseeing, my kids were thrilled with the beautiful jungle gym and slide. It was a cold, breezy spring day but we still spent an hour playing outside and had to drag the kids away when we were done. My teenagers loved shopping in the large gift shop. We bought handmade bonnets as our souvenir. They sell homemade jams and jellies and the famous chow-chow (pickled beans). The only thing we wished was that we could have had the opportunity to visit with someone who actually lives the Amish faith and lifestyle. For families looking to learn more about the Amish way of life, this farmhouse and village tour was the perfect experience. We finished our Amish experience with a delicious farm-to-table lunch buffet at the Plain and Fancy Farm Restaurant. The family-style food was delicious. We loved trying chow chow (an aquired taste perhaps), but the shoo-fly pie was delicious. When: Monday-Saturday, 9:00-5:00. Sunday, 10:00-5:00. Farmhouse tours run every 15 minutes. Disclosure: Thank you to The Amish Village and the Plain and Fancy Farm Restaurant for hosting my family so I could review these sites for you. I really would love to visit Amish Country someday!